Danielle Williams looks in for the sign. The freshman threw her sixth complete-game shutout of the season in the Wildcats’ win on Friday. After six straight weekends playing away from Evanston, Northwestern wasted no time treating its fans to a thrill in Friday’s home opener. Sophomore second baseman Rachel Lewis led off the Wildcats’ first inning with a monster home run onto the top of Welsh-Ryan Arena beyond the left-field wall, and NU (22-6, 3-0 Big Ten) cruised from there to an 8-0, five-inning victory over Rutgers (15-14, 0-3) at Sharon J. Drysdale Field to open conference play. Once again, freshman pitcher Danielle Williams was spectacular in the circle, allowing just two hits and two walks in the run-rule win. She improved to 14-3 on the mound this season with Friday’s win and lowered her ERA to 1.17. Williams dealt with a tight strike zone all afternoon but still threw her sixth complete-game shutout of the year. She struck out four, and only three batted balls left the infield. Williams had plenty of run support from the outset. One out after Lewis’ sixth home run of the year, freshman shortstop Maeve Nelson hit an opposite-field blast, her fifth of the season, to give the Cats a 2-0 lead in the first. NU added a pair in the third. With two on and one out, freshman catcher Jordyn Rudd hit a double over the center fielder’s head to score a third run, and then senior first baseman Lily Novak singled through the left side to make it a 4-0 game. The Cats then put the game away in the fourth. 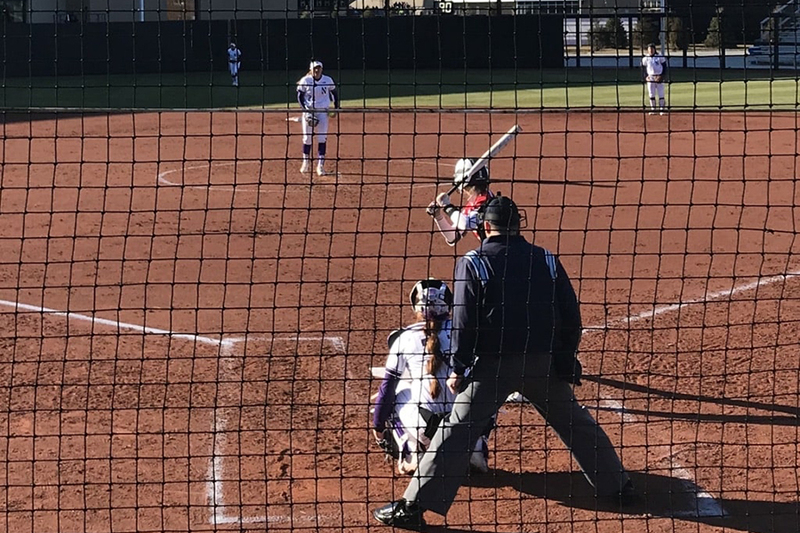 NU loaded the bases with two outs, and freshman designated hitter Nikki Cuchran promptly unloaded them with a grand slam off the video board just to the right of dead center field. Williams took care of the rest, not allowing a hit until the fourth inning. She worked around a leadoff double in the fifth to hold the Scarlet Knights off the scoreboard and end the game early. Seven NU starters recorded at least one hit, with Nelson and Cuchran having multi-hit games. The Cats hit multiple home runs just twice in their first 24 games, but have now hit seven in their last two, with Lewis and Nelson having gone deep both last Saturday at Indiana and Friday. In a doubleheader on Saturday, NU extended its win streak to five games, claiming 5-3 and 9-1 wins over the Scarlet Knights. Rudd and Novak both went deep during a three-run sixth inning in game one, while Williams clinched her 15th win of the season in the second victory. NU figures to be right in the thick of a tight Big Ten title race, with Minnesota, Indiana, Wisconsin and defending champion Michigan also expected to contend. The Cats have not won a conference title since 2008, but a deep pitching staff and a strong freshman class have this year’s group thinking big.